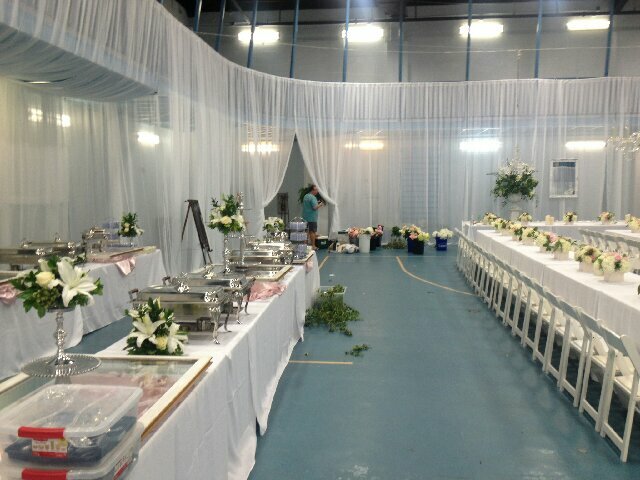 Prep time (decorating, etc.) and clean up time MUST be included in hourly rate. Renters will not be allowed in reserved area outside of that time. * All rentals exceeding ECC operational hours will be charged an additional $10/hour for staffing. (See ECC Facilities page for operational hours). ** Civic rates are for non-profit organizations, government agencies & charitable organizations that can provide a 501(c)3. All alcohol related rentals are required to pay a cleaning fee & security fee (see fees below). Includes commercial size ice maker, refrigerator, warmer, microwave & sink. Civic Rate: $350.00 per day (for non-profit, government agencies and charitable organizations with a 501(c)3). Includes 2 lifeguards and use of the Playroom in which to eat food. **Limit of 50 swimmers. Over 50 swimmers you must pay for additional lifeguards at $10/hour per lifeguard. 2. Swim during the time the pool is open to the public. 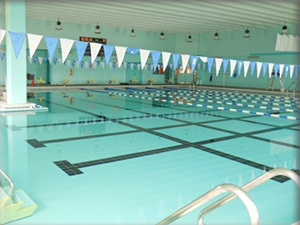 (See home page for pool schedule) 2 HOURS MAXIMUM swim time for parties. 3. Admission fees must be paid at the front desk for each swimmer ($4/child, $5/adult OR purchase a coupon book at a discounted rate of $38 for 15 admissions). Each swimmer is required to sign in & receive an arm band before entering the pool. 4. We now require all pool parties to pay for an additional lifeguard. This lifeguard will supervise the rented guests only. Fee is $15 with a 2 HOUR MAXIMUM swim time. All alcohol related rentals are required to pay cleaning fees. If rental does not include alcohol, the renter can still choose to pay for cleaning services. If renter chooses not to pay for cleaning services, it is renter's responsibility to adhere to all cleaning requirements outlined by the Manager. No alcoholic beverages of any kind are permitted on, in or at Recreation Department facilities unless an Alcohol Consideration Request Form is completed & approved by the Eufaula Parks & Recreation Board prior to the scheduled event. Requests must be made at least 30 days prior to the event. 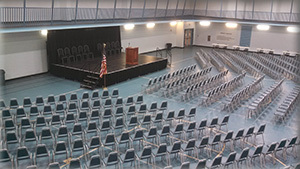 A $30-$50/hour fee (varies depending on type of event and whether we will require staff AND security, or just security) will be charged, along with a clean up fee of $100 (Community Room/Gym) or $50 (meeting rooms). The security/staff fee starts when your guests begin consuming alcohol and ends when you leave the building. A refundable damage deposit will also be required. Alcohol Consideration Request Forms can be obtained at the Eufaula Community Center (please see Manager). 1) Renter shall be responsible for designating a responsible person(s) to supervise the facilities rented & all persons permitted to be within the facilities to adequately ensure compliance with this agreement. 2) Renter shall provide competent adult supervision of any & all activities & guests of Renter. Recreation Department staff are building supervisors & shall not be called upon to supervise activities or guests of Renter. Special supervision may be required as determined necessary by the Recreation Department. 3) Smoking and smokeless tobacco are prohibited in all City of Eufaula buildings. 4) Illegal or illicit drugs are not permitted in Recreation Department facilities or on Recreation Department property. All vehicles and individuals on City of Eufaula property are subject to drug searches. 5) No alcoholic beverages of any kind are permitted on, in or at Recreation Department facilities unless prior approval has been obtained. If the presence of alcohol without approval is suspected, Renter agrees to allow Recreation Department staff members, and/or the Eufaula Police Department to search the property or any individual present. If alcohol is found, the event will be shut down and Renter will be asked to leave WITHOUT reimbursement. 6) Installation of equipment, alteration of existing building or facilities, use of materials that affect the condition of floors, walls or other building parts may not be undertaken without specific approval from the Director of Parks and Recreation. 7) Groups or organizations using the facilities shall assume all responsibility for taxes or other fees in connection with their programs unless prior arrangements have been made with the Recreation Department. 8) Any rental in which a cover/admission charge is involved, or the selling of items, must be approved by the Parks & Recreation Board and additional security may be required. 9) Advertising or sales of merchandise and printed matter, except that incidental to the program, are forbidden on City of Eufaula grounds. 10) Evening activities and programs on City of Eufaula property shall be concluded thirty (30) minutes prior to the end of the staff’s work day. City parks close at 10:00 p.m. and must be vacated by that time. Exceptions may be granted only with the prior approval of the Director of Parks and Recreation. 11) Rental fees shall be determined in advance and agreements are not transferable. A 10% handling fee will be charged for any cancellation. However, NO REFUND will be given if cancellation is made within the 14 days prior to rental. No refunds for early departures. 12) A cleaning charge of $15.00 per hour will be billed to the Renter if the rented area is not clean and left in the manner it was found. When deposits are required and the charges are not immediately paid, they shall be deducted from the damage deposit. 13) Seating, other special equipment or facilities arrangements shall be made at the time the rental agreement is issued. Extra compensation shall be paid to cover costs for supervision, transferring equipment, setting up equipment in the building or facility or other services. 14) Fire and safety regulations shall be observed. 15) Violation of these rules and regulations shall restrict future facility use agreements. Rules and regulations for the facilities shall be enforced during the event as to any and all guests, members, invitees, or attendees of the Renter and any uncooperative person or persons conducting themselves in a disruptive manner will be removed from the premises immediately. An ECC FACILITY REQUEST FORM must be completed & a deposit of at least half the total fee made at least 30 days prior to the date the facilities are requested. All rental agreements are subject to approval by the Director and/or the Parks & Recreation Board. For more information, please call Jennifer Lunsford at (334) 687-1246 or email.